Combining seamless construction and crisp design lines, this elegant collection provides strength, comfort, beauty and durability. 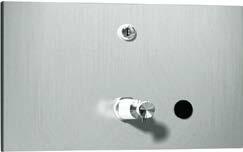 Constructed with 18 gauge stainless steel doors and 20 gauge cabinets, which are attached with concealed 3/16" (5 mm) diameter piano hinges for durability. Fully removable waste cans allow contents to be easily discarded for efficient ongoing maintenance and cleanliness. 6462-2 Semi-recessed with 2" stainless steel collar. 6462-9 Surface mounted with 9" stainless steel collar. Dispenses 600 C-fold or 800 multi-fold paper towels. 5 gal. (18.9 L) stainless steel waste receptacle. 6467-9 Surface mounted with 9" stainless steel collar. 64676-2 Semi-recessed with 2" stainless steel collar. 64676-9 Surface mounted with 9" stainless steel collar. 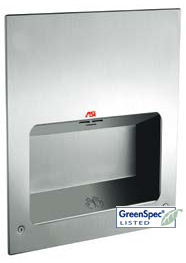 Paper towel dispenser with waste receptacle and < 15 second automatic hand dryer, dispenses 500 standard multi-fold or 400 standard C-fold paper towels with a waste capacity of 6.8 gal. (26 L). 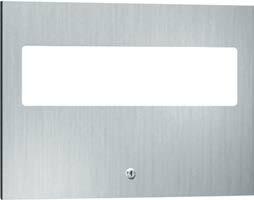 Durable 20 gauge stainless steel cover has a satin finish. Dryer has 5-year warranty. 110-120V. Optional voltages available. 64672-2 Dryer Voltage is 208-240V Dryer. 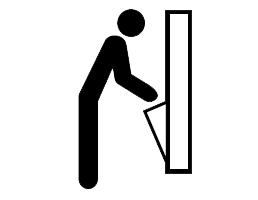 64672 Cabinet only – no hand dryer included. Anti-ligature dryer designed for Behavioral Health environments—angled top, welded corners and single tube exhaust prevent looping, tying off, wedging and prying. Tamper-resistant 18 gauge stainless steel cover, and flush pin-hex security screws. Optional voltages available. Fast drying, less than 15 seconds, operates automatically using infrared sensor with auto-resetting thermostat. Owner adjustable air speed & temperature and on/off heating options. Dryer automatically shuts off after time-out when user removes hands from sensor zone. Optional voltages available. 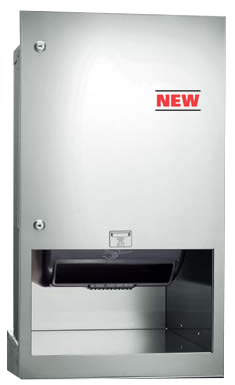 Dispenses 350 C-fold or 475 multi-fold paper towels. 2 gal. (7.6 L) stainless steel waste receptacle. 64623-9 Surface mounted with 9" stainless steel collar. Proximity sensing no-touch recessed unit dispenses an owner-adjustable length per cycle from 8" (205 mm) wide, 800 ft. (244 m) long rolls. Fabricated of 20 gauge stainless steel with satin finish. A: Powered by 4 D-size batteries (not included). AC: Powered by AC plug-in adapter. -6: Semi-recessed with 6" stainless steel collar. -9: Surface mounted with 9" stainless steel collar. Mechanically dispenses 8" or 9" (205 or 230 mm) wide, 800 ft. (244 m) long rolls in pre-set lengths of 2½", 4" or 5" (65, 100 or 125 mm) per stroke. 8.6 gal. (32.6 L) stainless steel waste receptacle. 64696-6 Semi-recessed with 6" stainless steel collar. 64696-9 Surface mounted with 9" stainless steel collar. Proximity sensing no-touch unit dispenses a pre-set length per cycle from 8" or 9" (205 or 230 mm) wide, 800 ft. (244 m) long rolls. 8.6 gal. (32.6 L) stainless steel waste receptacle. 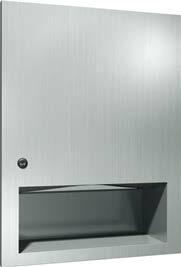 Well-suited for the smaller washroom with less space and traffic, this unit dispenses 350 C-fold or 475 multi-fold paper towels. Dispenses 600 C-fold or 800 multi-fold paper towels. 6452-9 Surface mounted with 9" stainless steel collar. Stainless steel waste receptacle holds 4 gal. (15 L) of waste and has a self-closing panel that covers its opening. Stainless steel waste receptacle holds 12 gal. (45.4 L) of washroom waste materials. 6474-2 Semi-recessed with 2" stainless steel collar. Dispenses 30 feminine napkins and 27 tampons. Universal coin mechanism allows for 25¢, 50¢ and free (no coin) operation. Choose appropriate suffix (-25, -50 or –F). Its door has 2 tumbler locks. Its inside coin box has a separately keyed lock. 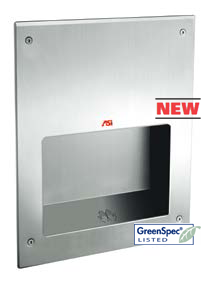 64684 designed for 4" (102 mm) wall opening; dispenses 15 napkins and 23 tampons. 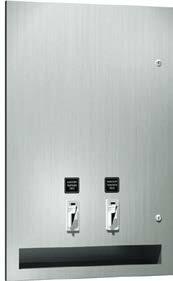 Features a self-closing stainless steel push door that covers the disposal opening along with a removable 1.9 gal. 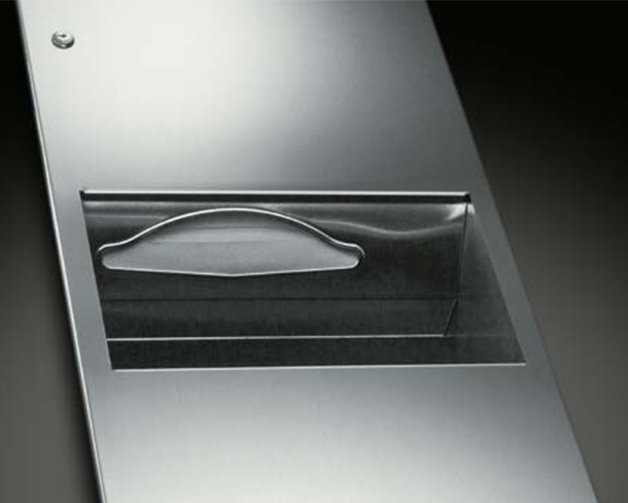 (7.2 L) stainless steel waste receptacle.